Bishop and martyr, born at Szczepanów (hence called Szczepanowski), in the Diocese of Cracow, 26 July, 1030; died at Cracow, 8 May, 1079; feast on May 7 in Roman Martyrology, but on 8 May in Cracow, which has a special feast of the translation of his relics on 27 September; patron of Poland and the city and Diocese of Cracow; invoked in battle. In pictures he is given the episcopal insignia and the sword. Larger paintings represent him in a court or kneeling before the altar and receiving the fatal blow. No contemporary biography of the saint is in existence. At the time of his canonization a life appeared written by a Dominican Vincent(?) (Acta SS.,May, II, 196) which contains much legendary matter. His parents, Belislaus and Bogna, pious and noble Catholics, gave him a religious education. He made his studies at Gnesen and Paris(?). After the death of his parents he distributed his ample inheritance among the poor. Lambert Zula, Bishop of Cracow, ordained him priest and made him pastor of Czembocz near Cracow, canon and preacher at the cathedral, and later, vicar-general. After the death of Lambert he was elected bishop, but accepted only on explicit command of Pope Alexander II. He worked with his wonted energy for his diocese, and inveighed against vices among high and low, regardless of consequences. Boleslaw II had become King of Poland. the renown he had gained by his successful wars he now sullied by atrocious cruelty and unbridled lust. Moreover the bishop had several serious disputes with the king about a piece of land belonging to the Church which was unjustly claimed by Boleslaw, and about some nobles, who had left their homes to ward off various evils threatening their families and who were in consequence cruelly treated by the king. Stanislaus spared neither tears nor prayers and admonitions to bring the king to lead a more Christian life. 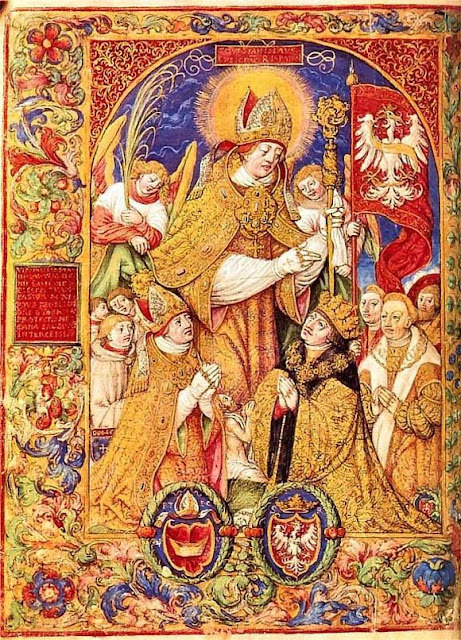 All being in vain, Boleslaw was excommunicated and the canons of the cathedral were instructed to discontinue the Divine Offices in case the king should attempt to enter. Stanislaus retired to the Chapel of St. Michael in a suburb of Cracow. The king was furious and followed the bishop with his guards, some of whom he sent to kill the saint. These dared not obey, so Boleslaw slew him during the Holy Sacrifice. The body was at first buried in the chapel, but in 1088 it was transferred to the cathedral by Bishop Lambert II. St. Stanislaus was canonized 1253 by Innocent IV at Assisi.